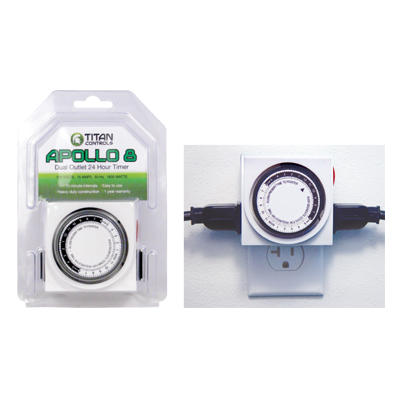 The Apollo 8 - 24 hour timer is the perfect timing solution for your hydro systems. With two outlets and a 15 Amp capacity, it's easy to set to run your pumps, fans, etc. 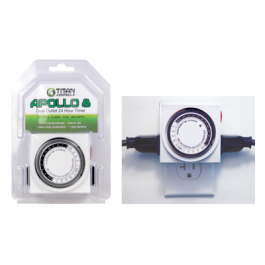 The Apollo 8 has 96 non-detachable 15 minute trippers and can be configured in numerous timing schedules to meet the most demanding timing requirements. Two (2) outlets. 15 minute intervals. Heavy duty construction. Easy to use & simple to operate. Plastic enclosure resists dust, rust and moisture. Do not use with digital ballasts. 15 Amps maximum/120 Volts/60 Hz.